C. Pierce Salguero's Working Paper on Healing and/or Salvation? 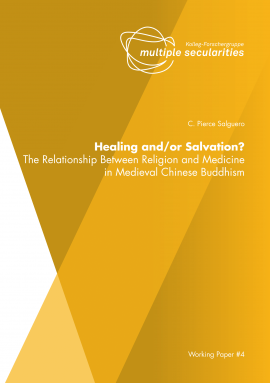 The Relationship Between Religion and Medicine in Medieval Chinese Buddhism is now online in our publications section. Pierce investigates how the boundaries between healing and salvation are discursively constructed and defended in Buddhist discourses. His analysis focuses on the language, categories, and logics internal to the Buddhist texts themselves. We welcome Ursula Rao, Katja Triplett and Madlen Krüger who just started their residencies at the KFG in April. Ursula Rao will work on a project exploring The making and unmaking of sacred terrain within secular urban space through “insurgent architecture” and contested religious rituals in the central Indian state capital of Bhopal. Katja Triplett will continue her work on Buddhism and Medicine in Pre-modern Japan and Beyond. Madlen Krüger works on Notions of Secularity within the Discourse of Democratization in Myanmar.